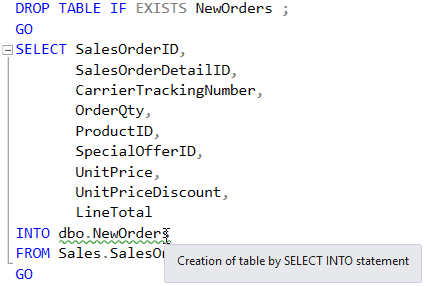 We can use SELECT…INTO in SQL Server to create a new table from a table source. SQL Server uses the attributes of the expressions in the SELECT list to define the structure of the new table. Prior to SQL Server 2005, use of SELECT…INTO in production code was a performance ‘code smell’ because it acquired schema locks on system tables of the database, causing SQL Server to appear unresponsive while the query was being executed. This is because it is a DDL statement in an implicit transaction, which is inevitably long-running since the data is inserted within the same SQL Statement. However, this behavior was fixed in SQL Server 2005, when the locking model changed. SELECT…INTO became popular because it was a faster way of inserting data than using INSERT INTO…SELECT…. This was mainly due to the SELECT…INTO operation being, where possible, bulk-logged. Although INSERT INTO can now be bulk-logged, you may still see this performance advantage in SQL Server 2012 and 2014, because SELECT…INTO can be parallelized on these versions, whereas support for parallelization of INSERT INTO only emerged in SQL Server 2016. However, with SELECT…INTO, you still have the task of defining all required indexes and constraints, and so on, on the new table. A recommendation to avoid use of SELECT…INTO, for production code, is included as a code analysis rule in SQL Prompt (PE003). However, a table source can be many things other than a conventional table, such as a user-defined function, an OpenQuery, an OpenDataSource, an OPENXML clause, a derived table, a joined table, a pivoted table, a remote data source, a table variable or a variable function. It is with these more exotic table sources that the SELECT…INTO syntax becomes more useful. Is SELECT INTO part of the ANSI standard? The ANSI standards do support a SELECT…INTO construct; it is called a singleton select and it loads a single row with values, but it’s very seldom used ( Thanks to Joe Celko for pointing this out). People often use SELECT…INTO with the misunderstanding that it is a quick way of copying tables, and so it comes as a surprise that none of the indexes, constraints, calculated columns, or triggers defined in the source table are transferred to the new table. They can’t be specified in the SELECT…INTO statement either. It also does nothing about nullability or preserving computed columns. All these tasks must be done retrospectively with the data in place, which inevitably takes time. You can, though, use the function IDENTITY (datatype, seed, increment) to set up an identity field, and it is possible, when the source is a single table, to make a column of the destination table into an identity column. It is this fact that probably leads developers to assume that it will transfer other column attributes. Furthermore, it also can’t create partitioned tables, sparse columns, or any other attribute inherited from a source table. How could it when the data might be coming from a query involving many joins, or from some exotic external data source? Since SQL 2012 SP1 CU10, SELECT…INTO can be executed in parallel, However, since SQL Server 2016, Parallel Insert has been allowed on the conventional INSERT INTO…SELECT statement, with certain restrictions, so any performance advantage of using SELECT…INTO is now rather diminished. The INSERT INTO process can also be speeded up if it can be bulk-logged, rather than fully-recovered, by setting the recovery model to simple or bulk logged, inserting into an empty table or a heap, and setting the TABLOCK hint for the table. The following summarizes some of the restrictions and limitations when using SELECT…INTO. The SELECT statement contains joined tables (using either JOIN or UNION), GROUP BY clause, or aggregate function. If you need to avoid an IDENTITY property from being carried over to the new table, but need the values of the column, it is worth adding a JOIN to your table-source on a condition that is never true, or a UNION that provides no rows. You cannot SELECT…INTO either a table-valued parameter or a table variable as the destination, though you can select FROM them. Even if your source is a partitioned table, the new table is created in the default filegroup. However, in SQL Server 2017, it is possible to specify the filegroup in which the destination table is created, via the ON clause. You can specify an ORDER BY clause, but it is generally ignored. Because of this, the order of IDENTITY_INSERT isn’t guaranteed. When a computed column is included in the SELECT list, the corresponding column in the new table is not a computed column. The values in the new column are the values that were computed at the time SELECT…INTO was executed. As with a CREATE TABLE statement, if a SELECT…INTO statement is contained within an explicit transaction, the underlying row(s) in the affected system tables are exclusively locked until the transaction is explicitly committed. In the meantime, this will result in blocks on other processes that use these system tables. There is some confusion about problems that can happen with the use of SELECT…INTO using temporary tables. SELECT…INTO has gained a somewhat unfair reputation for this, but it was part of a more general problem involving latch contention in tempdb under a heavy load of small temp table creation and deletion. When SELECT…INTO was adopted with enthusiasm, it could greatly increase this type of activity. The problem could be easily fixed in SQL Server 2000 onwards with the introduction of the use of trace flag TF1118, which is no longer required from SQL Server 2016 onwards. For a full explanation, see Misconceptions around TF 1118. In summary, SELECT…INTO is a good way of making a table-source temporarily persistent as part of a process, if you don’t care about constraints, indexes or special columns. It is not a good way of copying a table because only the barest essentials of the table schema can be copied. Over the years, there have been factors that have increased or decreased the attraction of SELECT…INTO, but overall it is a good idea to avoid using it whenever possible. Instead, create a table explicitly, with the full range of features that the table possesses that are designed to ensure that data is consistent. This is all well and good but do you have any actual demonstrable code to support this article? The ANSI standards do support a select into construct; it is called a singleton select and it loads a single row with values. Nobody uses it. thanks Joe – added a note to this effect.